Bringing together Scriptural texts, reflections, prayers and background music, this collection from Father Carmelo Erdozáin helps listeners experience the Way of the Cross in a more meaningful way. This CD contains reflections, prayers and background music for each of the 14 stations of the Cross. This MP3 album contains reflections, prayers and background music for each of the 14 stations of the Cross. The devotion known as the Via Crucis, or the Way of the Cross, originated with pilgrims who walked the Via Dolorosa (the "way of tears") in Jerusalem. It is traditionally divided into 14 stations that commemorate Jesus Christ's journey from Pilate's praetorium to Golgotha (the Place of the Skull). 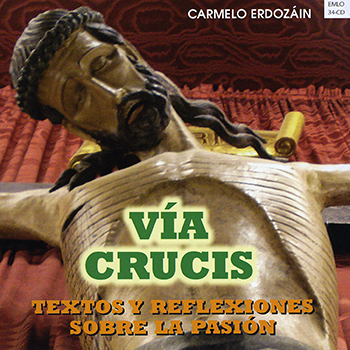 For this collection, Father Carmelo Erdozáin brings together Scriptural texts, reflections, prayers and background music in Spanish for each of the 14 stations. Featuring reflections written by Father Erdozáin along with songs from previous collections as well as classic seasonal music, Vía Crucis is meant to serve as a guide to experiencing the Way of the Cross in a deeper, more meaningful way.